Brr, it's cold. Pudding time. 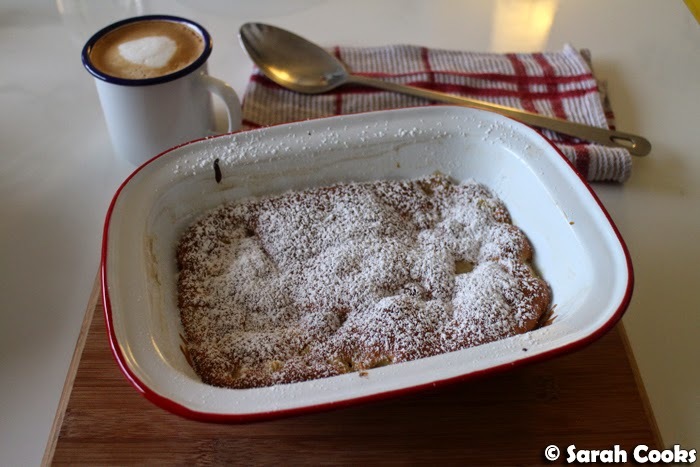 I've been making this apple sponge pudding, on and off, for the last year or so. It's so good! 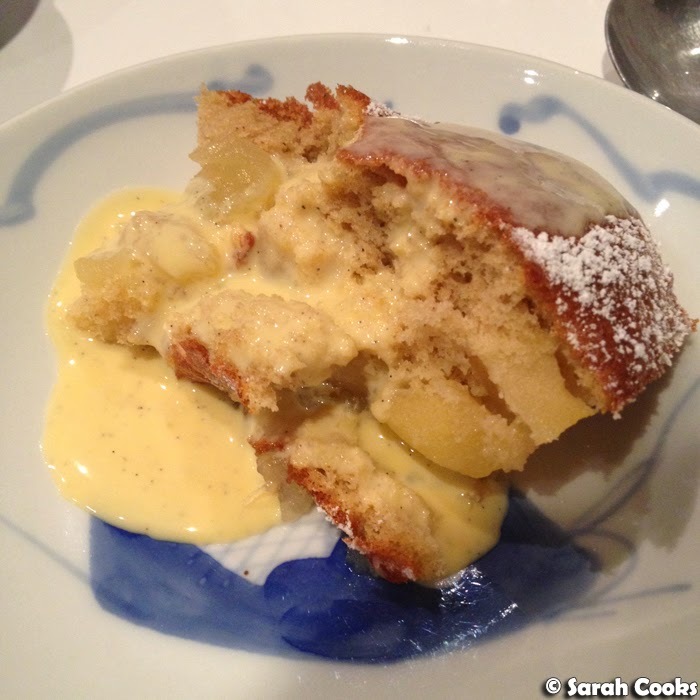 Basically it is just a layer of cooked apples, covered in a light sponge batter. It's warm and comforting, but not stodgy or heavy. Super delicious! 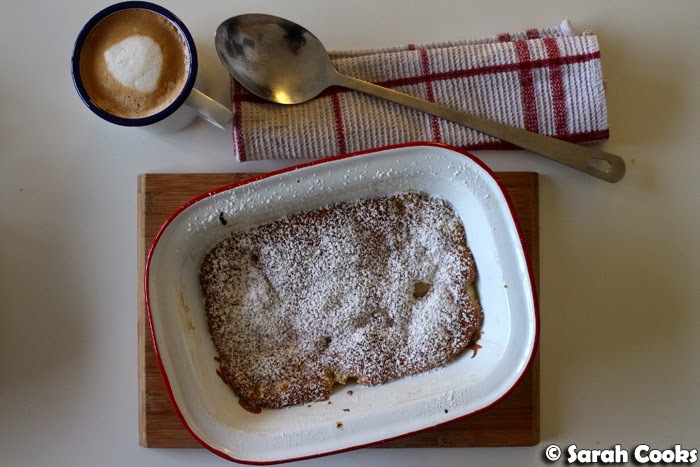 The original recipe is from Jamie Oliver's website, but I've tweaked the recipe to satisfy the apple-loving contingent in my household. 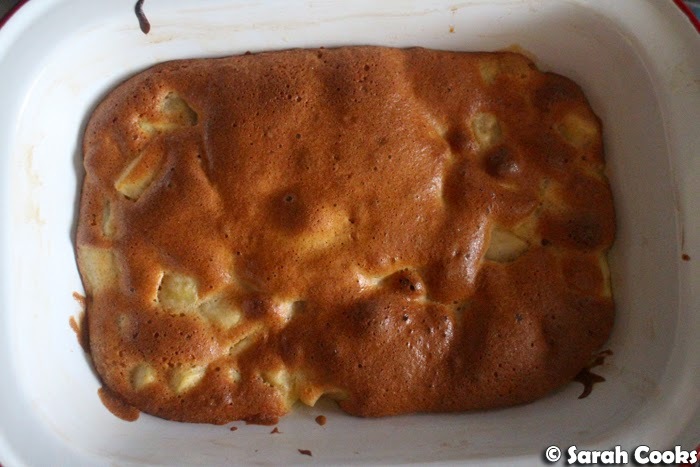 I reduced the quantities of cake batter to make a very thin layer, barely covering the apples. Boom. "Best dessert you've ever made". It's quite quick to make, especially if you have an electric hand-held whisk, but if you were feeling energetic then all you'd need is a normal whisk and some arm power! As I mentioned above, I have made this pudding a number of times, and if you want a thicker layer of cake, simply double the quantities of the sponge-layer ingredients. 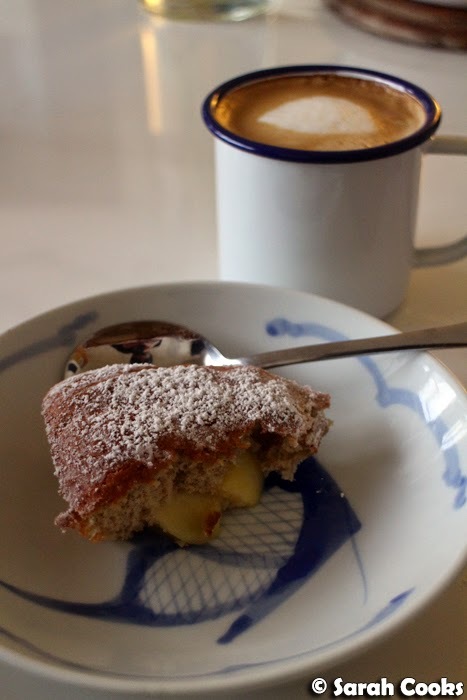 When I make it with the double-quantity of sponge mixture, it turns out thick and fluffy, as per the below picture. Whether made in double or single quantities, I like it best served hot out of the oven, drenched in hot vanilla custard. Gah! Perfect cold-weather treat! Peel, core and chop the apples into approx 1-cm chunks. Place in a small saucepan with caster sugar and water. 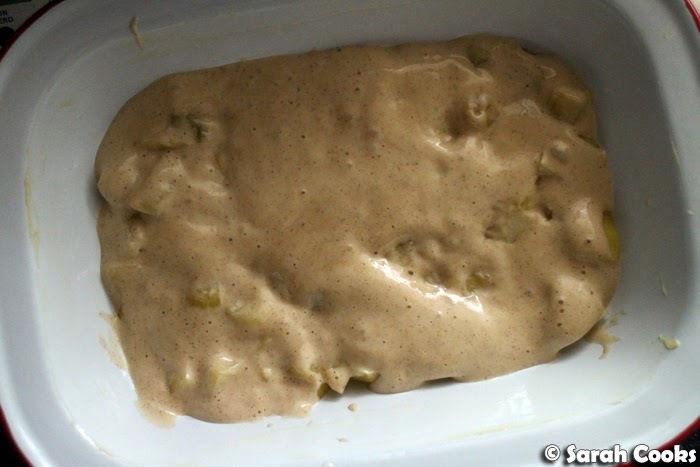 Cook over a medium heat, stirring occasionally, until the apples are softened. Set aside. Preheat the oven to 180C. Butter a baking dish. (I used a 18 x 24 cm oblong baking dish). Place the caster sugar and egg in a small mixing bowl, and whisk with an electric mixer until thick, aerated, and pale in colour. Gently whisk in the vanilla extract. Sift in the flour and mixed spice, and fold in gently until combined. Place the apples in the pie dish, and top with the eggy batter. Use a spatula to spread it out to the corners. Bake for 20 minutes, or until the sponge topping is golden brown and cooked through. Serve plain, or with vanilla custard or ice-cream. Beautiful! I've been craving this kind of thing lately, too. I was fantasising about a full Martha Stewart-style apple pie but ended up going for an apple and berry crumble this week instead. You sponge looks like another neat alternative. Mmm, this takes me back! 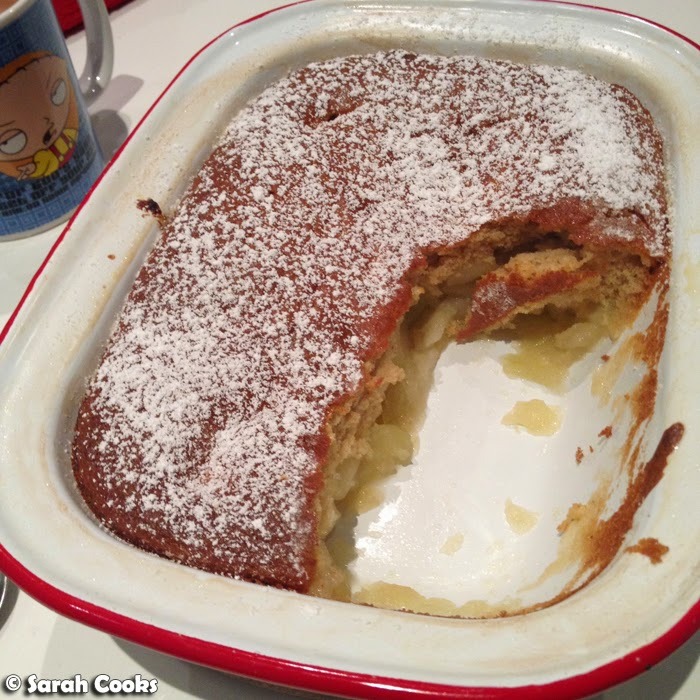 My mum used to make a pudding like this when we were little, but I'd completely forgotten about it until you posted this. Random fact for you: in the UK it's traditionally called Eve's Pudding. This looks so comforting! :D So perfect on a winter's day! Yummo. Agreed. Not so bad the cold weather if it is an excuse to make this! Yum yum. Definitely going to have to start including this in my winter recipe repetoire. It looks so simple and delish!